Noise Criterion - NC - were established in the U.S. for rating indoor noise like noise from air-conditioning equipment and similar. In Europe it is common to use the alternative Noise Rating Curve - NR. The method is based on a measurement of sound pressures levels and a set of sound pressure criteria curves ranging frequencies from 63 to 8000 Hz - and a tangent rating procedure. The criteria curves defines the limits of the octave band spectra that must not be exceeded to meet the occupants acceptance in the actual spaces. 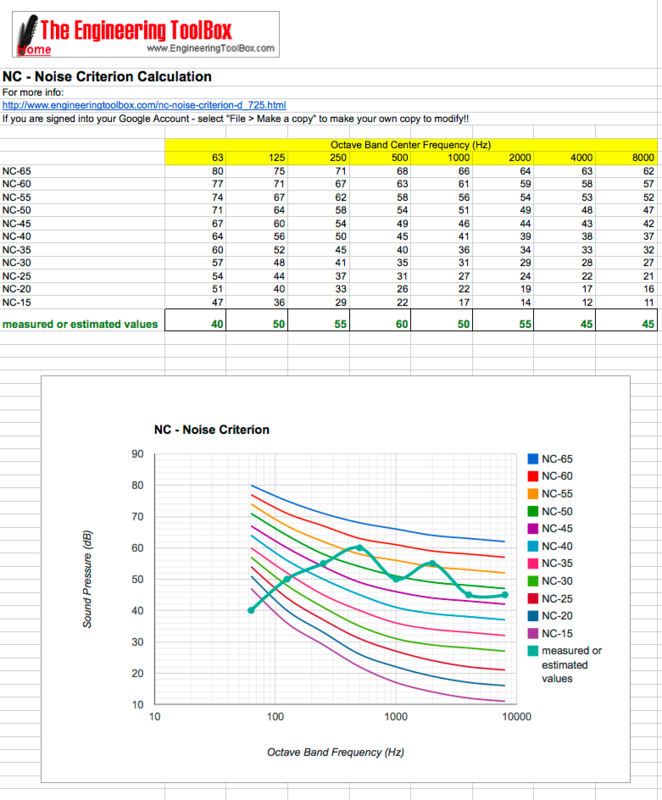 The NC rating can be determined by plotting the measured sound pressure at each octave band. The noise spectrum is specified as having a NC rating same as the lowest NC curve which is not exceeded by the spectrum. as indicated in the spreadsheet diagram below. You can save and modify your own copy (in Google Docs or as a Excel spreadsheet) of the example below. 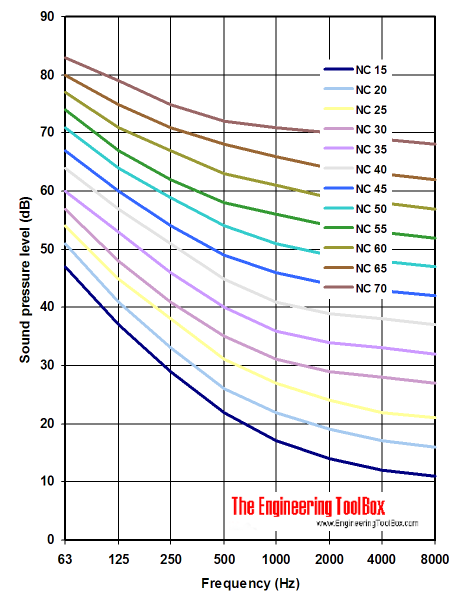 Balanced Noise Criteria (NCB) curves are used to specify acceptable background noise levels in occupied spaces and include noise from air-conditioning systems and any other ambient noise. They are intended to replace the NC curves. Engineering ToolBox, (2004). NC - Noise Criterion. [online] Available at: https://www.engineeringtoolbox.com/nc-noise-criterion-d_725.html [Accessed Day Mo. Year].